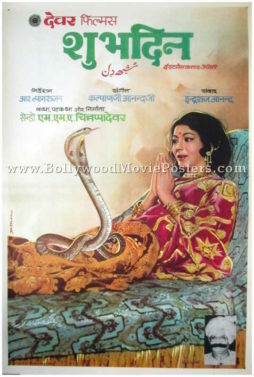 Bollywood posters, vintage Bollywood posters, old Bollywood posters, Bollywood film posters, old Indian cinema posters, old Hindi film posters, old Hindi movie posters, hand painted Bollywood posters, hand drawn Bollywood posters, Bollywood horror movie posters & all kinds of original vintage Bollywood memorabilia for sale! 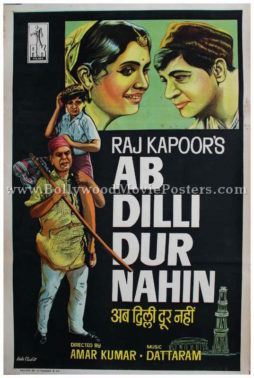 Original vintage hand drawn Bollywood movie poster of the Raj Kapoor film, Ab Dilli Dur Nahin (1957) for sale. 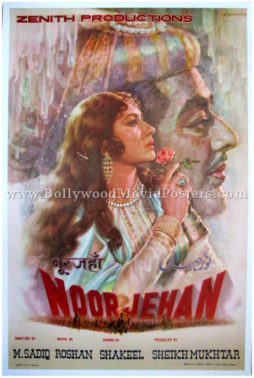 This is an original Bollywood poster of the 1957 film produced by the “Showman of Indian cinema” Raj Kapoor, starring Motilal, Jagdeep, Nand Kishore, Yakub, Anwar Hussain and Amjad Khan. The soundtrack of Ab Dilli Dur Nahin is fondly remembered for the popular song “Chun Chun Karti Aayi Chidiya” sung by legendary singer Mohammed Rafi and composed by Hasrat Jaipuri. Amjad Khan (Gabbar Singh of Sholay fame) made his debut at the age of 17 in the film Ab Dilli Dur Nahin. Printed and circulated during the first release run of the film (late 1950s), this rare Raj Kapoor movie poster was originally designed for publicity of the movie but never ended up being used. This hand painted Bollywood poster features hand drawn portraits of the actors set against prominent landmarks of Delhi sketched at the bottom. 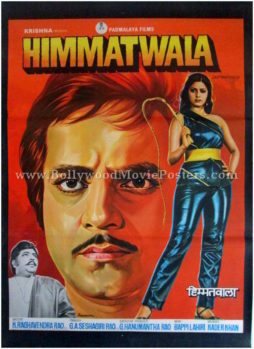 Rare original vintage publicity poster of one of the greatest Bollywood movies ever made, Deewaar (1975) for sale. 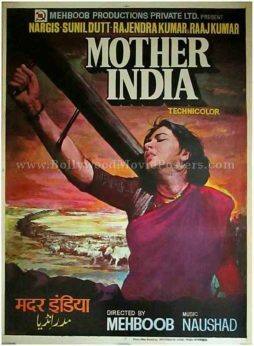 This is an actual surviving old movie poster of the 1975 action Hindi film that featured the biggest superstar of Indian cinema, Amitabh Bachchan in the lead role. Deewaar (sometimes also spelled as Deewar) is considered one of the most iconic movies ever made in Indian cinema and finds mention among the cult films of Bollywood. 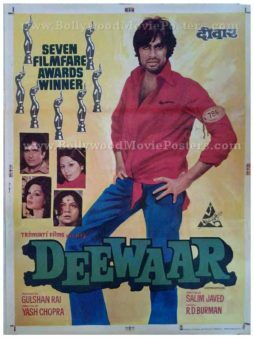 Printed and circulated a few years after the first release of Deewaar (somewhere in the early 1980s), this original movie poster celebrates Deewaar’s phenomenal success at the Filmfare Awards (where it bagged seven awards in different categories). This movie poster was intended for publicity of the film but never ended up being used. The poster was originally designed on a hand painted canvas by the greatest and highest paid Bollywood movie poster artist of all time, Diwakar Karkare. In the poster, artist Diwakar uses a knife to over paint Amitabh’s in order to give him a rugged or macho look. Smaller photographic still images of Shashi Kapoor, Neetu Singh, Parveen Babi and Nirupa Roy appear alongside. The typography used in this poster is completely in English, with a translation of the title in Devanagari Hindi on the top. 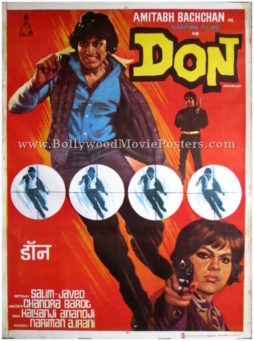 Beautiful hand drawn original old Bollywood movie poster of the cult Hindi film Don (1978) for sale. 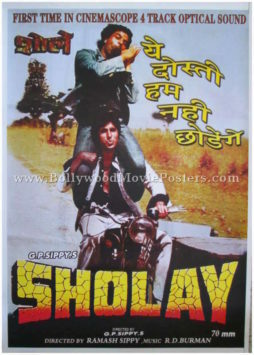 This is an actual surviving poster of the 1978 action film that featured the biggest superstar of Indian cinema, Amitabh Bachchan in a double role. The film is considered one of the most iconic movies ever made in Bollywood and finds mention among the cult films of Indian cinema. Printed and circulated several years after the release of the film, this vintage movie poster was originally designed for publicity of the film but never ended up being used. This poster was originally designed on a hand painted canvas by the greatest and highest paid Bollywood movie poster artist of all time, Diwakar Karkare. 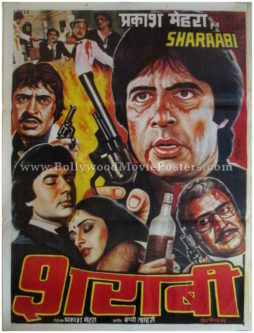 In the poster, Diwakar captures the original angry young man of Bollywood, Amitabh Bachchan, running from the police. Zeenat Aman is shown as a much smaller figure, holding a gun at the bottom right corner. 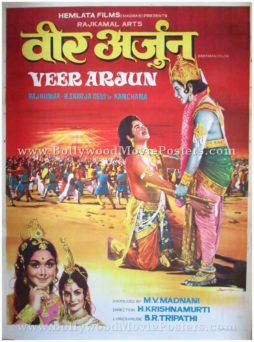 The typography used in this poster is primarily in English, with only the title translated in Devanagari Hindi on the bottom left. Old Amitabh poster of the superhero fantasy Hindi film, Ajooba (1991) for sale. This is an actual surviving old Bollywood poster for sale of the 1991 superhero flick that was produced and directed by Shashi Kapoor and featured the greatest superstar of Indian cinema, Amitabh Bachchan in the lead role. 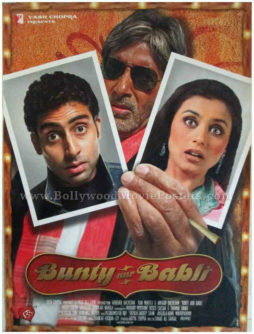 Printed and circulated a few years after the original first release of the film (somewhere in the mid 1990s), this old Amitabh poster was designed for publicity of the film but never ended up being used. This old Amitabh poster features a stunning photographic collage in which the superstar is seen in his superhero avatar. Smaller still photos of Rishi Kapoor, Amrish Puri, Dimple Kapadia and Sonam are seen at the bottom. 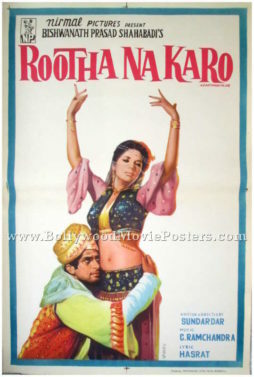 This poster has been graded as ★ As Is due to a small hole as seen clearly in the photograph (on the bottom left of the poster over actress Dimple Kapadia’s face). Please study the accompanying image carefully before making a purchase. Ajooba was co-directed by Soviet filmmaker Gennadi Vasilyev and produced in association with Gorky Studios in Moscow. A Russian language dub of the film was released in the Soviet Union as Vozvrashcheniye Bagdadskogo Vora. It is widely believed that superstar Amitabh Bachchan worked in the film for free, as a token of his gratitude for his closest friend and mentor Shashi Kapoor. 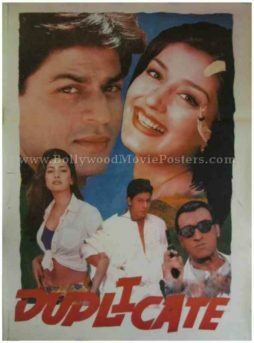 Old Bollywood film poster of the Hindi movie, Akele Hum Akele Tum (1995) for sale. 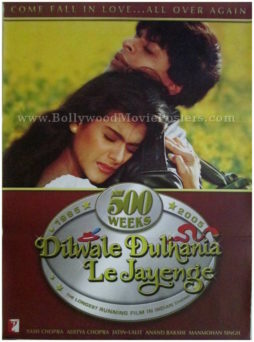 This is an actual surviving original Bollywood poster of the 1995 romance that featured one of the most influential actors in modern Indian cinema, Aamir Khan in the lead role. Printed and circulated a few months after the first release of the film (mid 1990s), this Aamir Khan poster was originally designed for publicity of the film but never ended up being used. 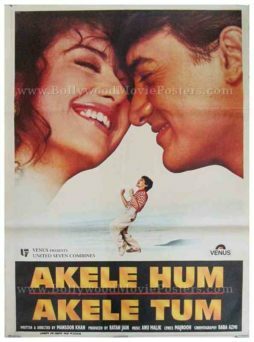 Akele Hum Akele Tum is a 1995 Bollywood romance that starred Aamir Khan and Manisha Koirala in lead roles. The film is believed to be modeled on the award winning Hollywood film Kramer vs Kramer. Music for the film was composed by Anu Malik and the song “Raja Ko Rani Se Pyar Ho Gaya” sung by Kumar Sanu & Alka Yagnik went on to become a rage throughout the nation. Highly collectible, original James Bond movie poster of the 2002 hit, Die Another Day for sale. This is an original poster of Die Another Day (2002), which starred Pierce Brosnan in the lead role of James Bond 007! 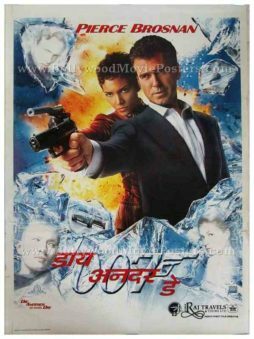 Printed and circulated in India somewhere in the 2000s during the film's release, this James Bond poster was originally intended for publicity of the film in India but never ended up being used. Die Another Day (2002) is the twentieth spy film in the James Bond series, and the fourth and last film to star Pierce Brosnan as the secret agent James Bond.